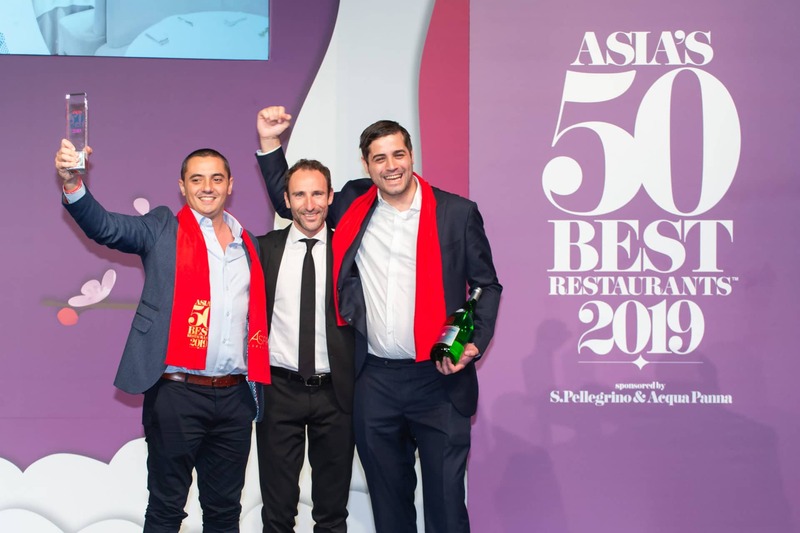 Photo courtesy of Asia’s 50 Best Restaurants 2019, sponsored by S.Pellegrino & Acqua Panna. 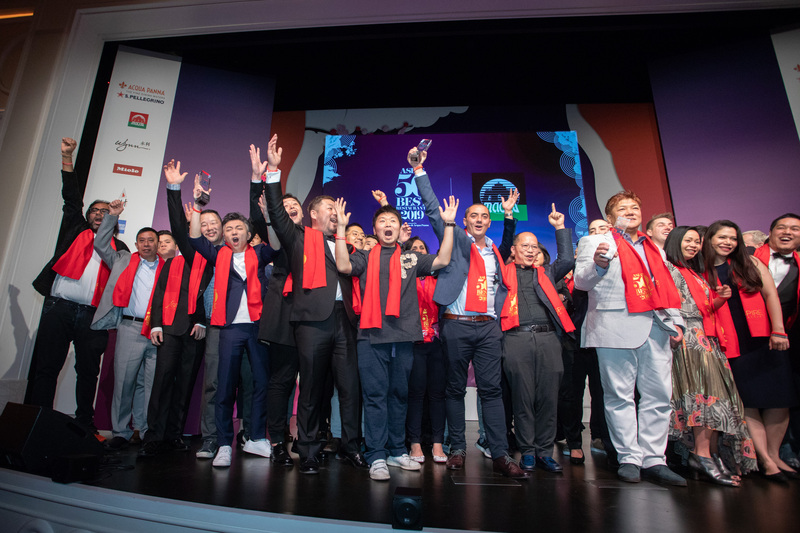 For the seventh edition of Asia’s 50 Best Restaurants, the prestigious awards, sponsored by S.Pellegrino & Acqua Panna, returned to Macau for a second year, bringing together the region’s leading chefs, restauranteurs and culinary elite at Wynn Palace once more. 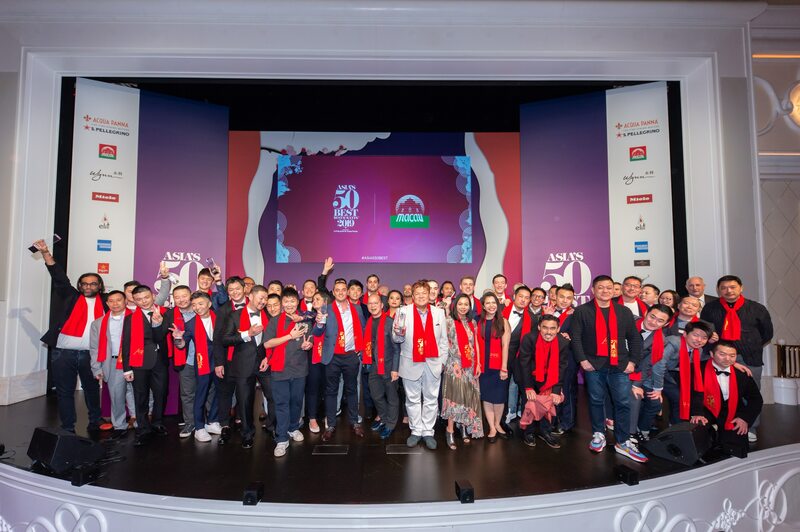 Asia’s 50 Best Restaurants was announced at an awards ceremony at Wynn Palace in Macau. 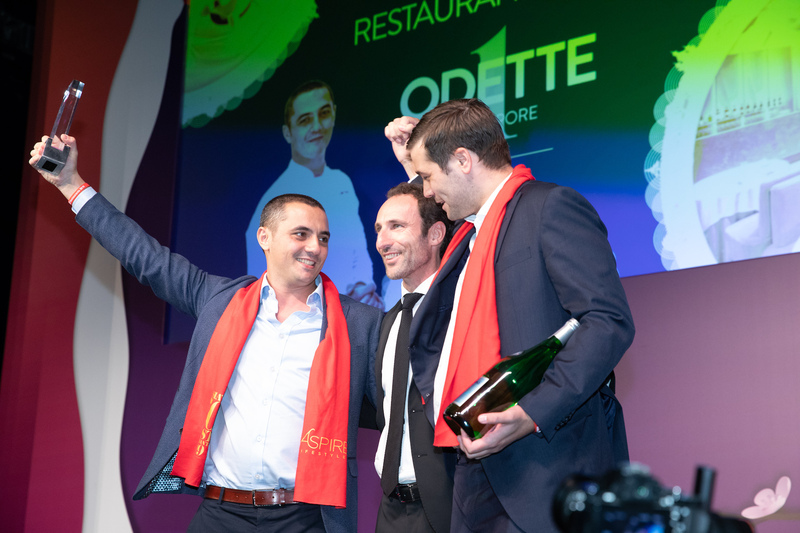 Julien Royer and Steven Mason, Odette (No.1), winner of The Best Restaurant in Asia, with Stefano Marini, Director, International Business Unit S.Pellegrino & Acqua Panna. Gaggan Anand and Rydo Anton, Gaggan (No.2), winner of The Best Restaurant in Thailand, with Dr. Alexis Tam Chon Weng, Secretary Social Affairs and Culture of the Macao SAR Government. Den's Zaiyu Hasegawa earns the title of The Best Restaurant in Japan (No.3) and was also rewarded the Chefs’ Choice Award. Umberto Bombana and Marino Bracci, 8 1/2 Otto e Mezzo Bombana (No.12), winner of the Art of Hospitality Award, with Charles Reed, Group Managing Director, William Reed. Daniel Calvert, Belon (No.15), winner of the Highest Climber Award. The award ceremony at Asia's 50 Best with the region's top chefs. Finally knocking chef Gaggan Anand off the top of the list is Singapore’s Odette, with Chef Julien Royer at the helm claiming the titles for The Best Restaurant in Asia and The Best Restaurant in Singapore with his Asian-inspired, contemporary French cuisine. Located within the National Gallery of Singapore, Odette is recognised for its artisanal approach — a reflection of the art housed within the iconic location — and their impeccably executed cuisine. 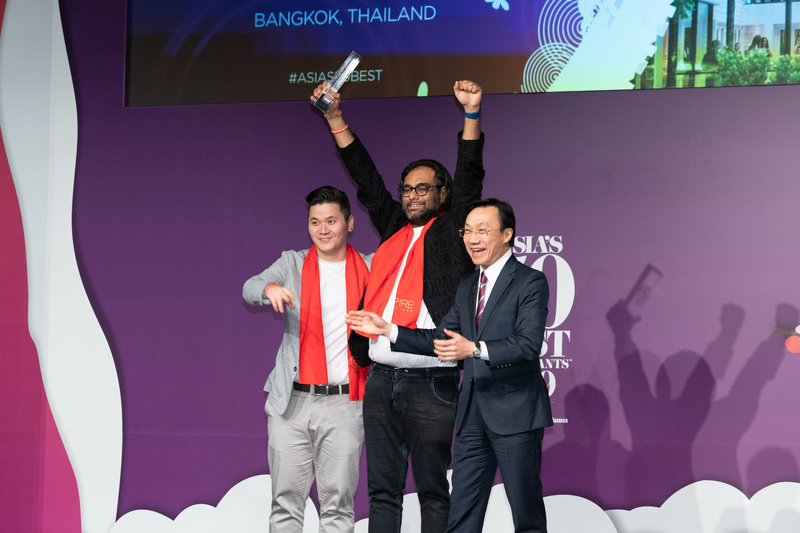 Gaggan won Asia’s Best Restaurant for four consecutive years from 2015 to 2018 for his eponymous Indian restaurant in Bangkok, and told Prestige how he was “ready to lose” last year. The chef claims second place for the restaurant but is now preparing to close it in 2020. He will be opening a new restaurant called GohGan, a collaboration with chef Takeshi “Goh” Fukuyama, in Fukuoka in 2021. Third place was taken by Den in Tokyo with the ever-charismatic chef Zaiyu Hasegawa earning the title of The Best Restaurant in Japan for a second year. 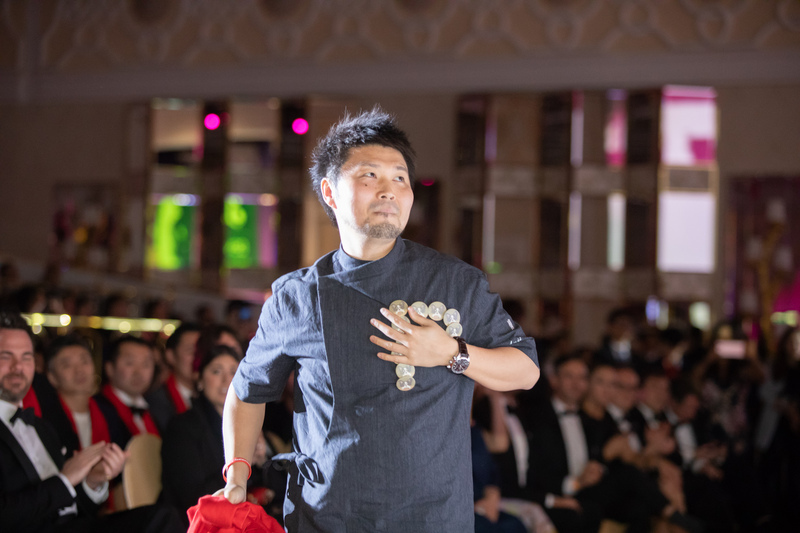 Hasegawa was also rewarded for his innovative style and approach, and named the 2019 recipient of the Chefs’ Choice Award. Hong Kong claimed nine spots on the list; The Chairman climbed up from No. 22 to No. 11, whilst first-time entrants VEA, helmed by chef Vicky Cheng, and Seventh Son took home No. 34 and No. 44, respectively. Most impressive, however, with this year’s Highest Climber award, is popular modern French bistro Belon, jumping an incredible 25 places to No. 15. Meanwhile in Macau, Jade Dragon rose eight places to No. 27, and Wing Lei Palace made its debut at No. 36. Other movements in Hong Kong to note: 8½ Otto e Mezzo Bombana rose one spot to No. 12, Richard Ekkebus’ Amber (which is currently closed for renovation) slipped from No. 7 to No. 21, Ta Vie from No. 16 to No. 50, fine-dining Cantonese restaurant Lung King Heen from No. 24 to No. 38, and David Lai’s Neighborhood fell slightly from No.32 to No.37. Ronin and Caprice, unfortunately, dropped off the list altogether. 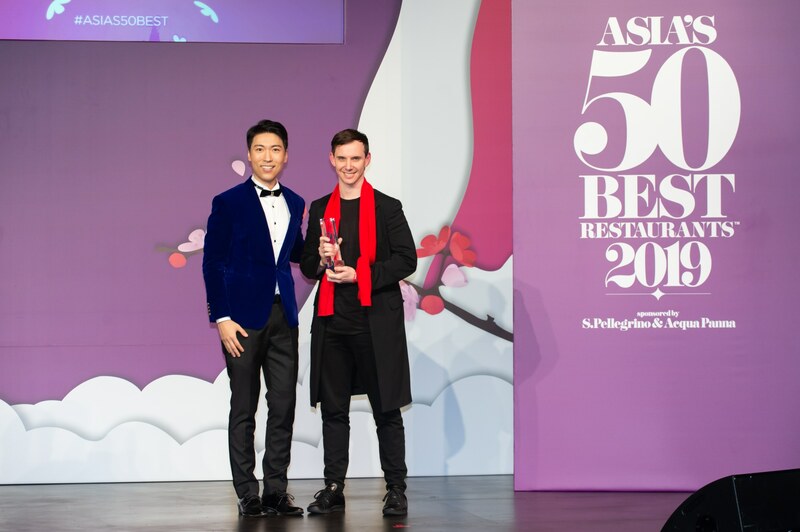 Ahead of the ceremony, three awards outside of the ‘50 Best’ list were announced including Miele One to Watch, which was presented to Singaporean chef Jimmy Lim of JL Studio in Taiwan. Only two years after opening, Lim has become one of Asia’s rising stars and continues to wow diners with his mod-Sin (or modern Singaporean) fare. Garima Arora of Gaa in Bangkok, one of Gaggan’s pupils, took the Highest New Entry at No.16 and won the elit™ Vodka Asia’s Best Female Chef award. Japanese chef Seiji Yamamoto of Nihonryori RyuGin in Tokyo was awarded the American Express Icon Award for his vision in progressive Japanese kaiseki cuisine. Other winners included the Valrhona award for Asia’s Best Pastry Chef, which went to Fabrizio Fiorani from Il Ristorante Luca Fantin in Tokyo. 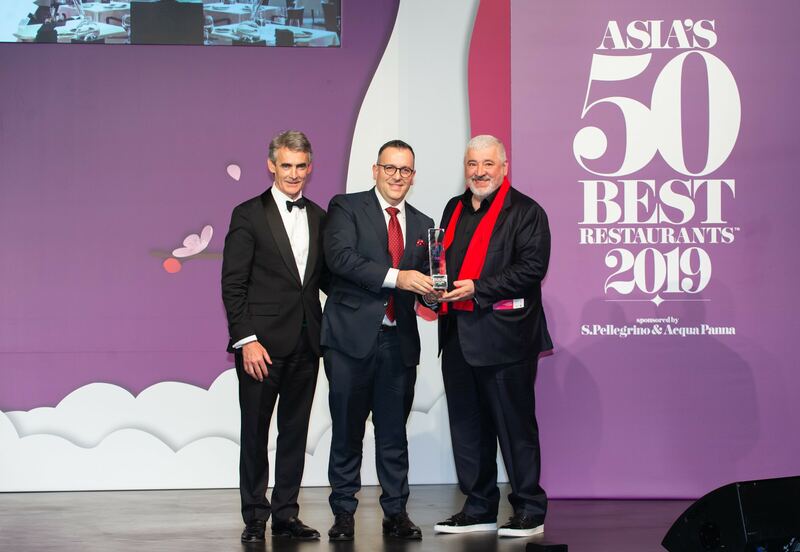 The Most Sustainable Restaurant Award in Asia was presented to Locavore in Bali, Indonesia, and the Art of Hospitality Award crowned Hong Kong’s 8½ Otto e Mezzo Bombana the leader in the industry. To create the list, a poll is collected from a group of 318 experts (made up of highly regarded food writers, critics, chefs and restaurateurs) across Asia who cast ten votes, in order of preference, for the restaurants they have had their best dining experience at in the last 18 months. At least four of those votes must be for restaurants outside of their home country. For more information, visit Asia’s 50 Best Restaurants.